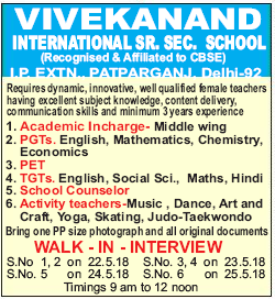 Vivekanand International Sr. Sec School, Delhi has advertised in THE HINDUSTAN TIMES newspaper for the recruitment of TGT plus PGT vacancies. Interested and eligible job aspirants are requested to appear walk in from 22nd to 25th May 2018. Check out further more details below. About School: St. Vivekanand Educational & Cultural Welfare Society (Regd.) founded in 1978,consists of a body of highly experienced professionals that believe contribution to elevate the nation which can be attained by providing good education. The society believes that good education is the child’s fundamental right.